FILM- Lampini and his fiance, Ginger, run a small animal show at the local carnival. Their main attraction- Gorto the ape. After an encounter with a racist scumbag mechanic and a fake jewelry selling Rabbi, Ginger leaves Lampini. Devastated by the loss, he returns to the circus to find out his life has gotten worse; Gorto has escaped. Soon the lowlifes of Long Island are being castrated, sexually violated, and crushed to death by the bloody ape; with the politically incorrect police believing the murderous “monkey” to be a local black man. Does Lampini have more to do with these murders than it appears, or did Gorto just go bananas? I love this film. Really, I love it. When it arrived in my mailbox, the other package I had was a copy of the Camp Video tape of Video Violence- and that should tell you how much I like bad movies. 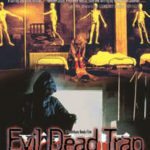 While most low budget films were show on VHS or Beta, this was shot on Super 8 mm. SOV films have a distinct cheap and blurry quality to them, while 8 mm looks like an unpolished grind house flick. If this had been shot on anything other than Super 8, I would have hated it, even VHS. The film looks horrible, but that’s what makes it SO much fun. 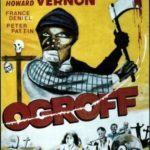 An homage to Night of the Demon, Night of the Bloody Ape, and numerous other 70’s trash, this film desperately needed to feel and look cheap, but not too cheap. The 8 mm is a perfect medium. The gore is cheap and fake looking, the monkey suit is God awful, and the women strip at every occasion- hat sentence should have just sold any exploitation fan. Anyone looking for political correctness had better burn this film, because you will find none here. Bumbling, racist cops, sexually and harassing mechanics make this one offensive pile of garbage (that said with nothing but love my the way). 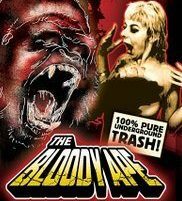 The Bloody Ape is one of the best throwbacks to the grind house era; and looks like the finished product if Jim Van Bebber and John Waters directed their own blood soaked version of the Jackass skit “Night Monkey”. 8/10. 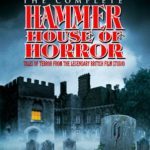 PICTURE/ AUDIO- While some people call movies like Cannibal Terror and Sledgehammer “so bad it’s good”, the picture to this one is so terrible it’s perfect! Like I have said, The Bloody Ape could not exist without the grind house feel. Digital aging and damage ala Planet Terror and Death Proof are good substitutes, but you can’t replace the genuine raw feel. The film stock had so many cigarette burns and damage spots it look like it was in abusive relationship with a chain smoking sadist! 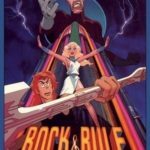 The quality is really about a one out of 10, but seeing as how it was so perfect for this film, I must give it an 8/10. The audio is the same as the film. Volume fading in some places make it more annoying than genuine feeling; but with 90% of the sound nice and strong (if not damaged) sounding, the audio is a fairly good companion to the picture. 7/10. EXTRAS- Most fledgling indie companies skimp put in this department. The folks over at Wild Eye came out swinging on this release! Included are: an audio commentary with the director and two actors, The Bloody Ape trailer, Blitzkrieg trailer, Grind house Gorilla- a making of featurette, One Grave Too Many- an early short film from Crocker, and still images from The Exploitation Journal, press book, original VHS cover, lobby cards, stills and misc. art. Overall the amount and quality of the still images and featurettes makes this a nice and balanced DVD. Also, the featurettes are very entertaining, and I love to hear how filmmakers like Crocker would cut corners to save on production costs. 9/10.